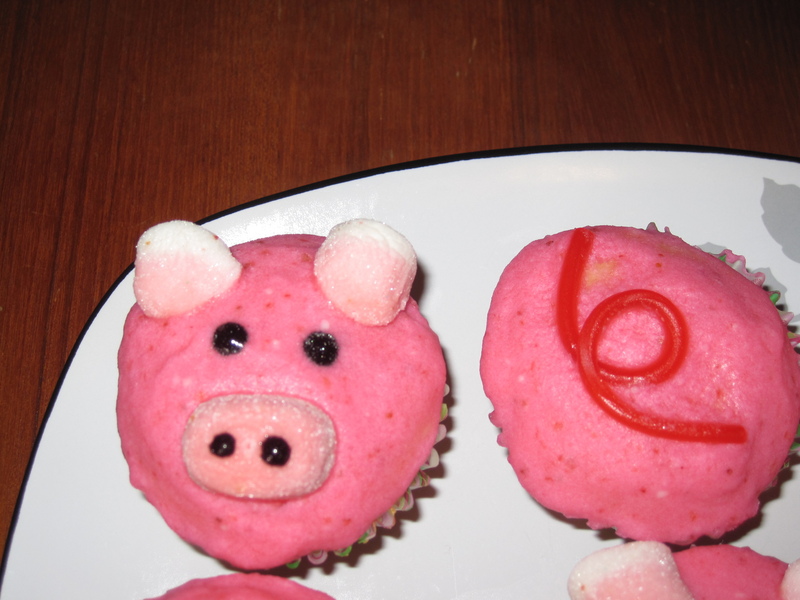 We were invited to a pig roast this past August, and so I got really excited to make pig cupcakes. 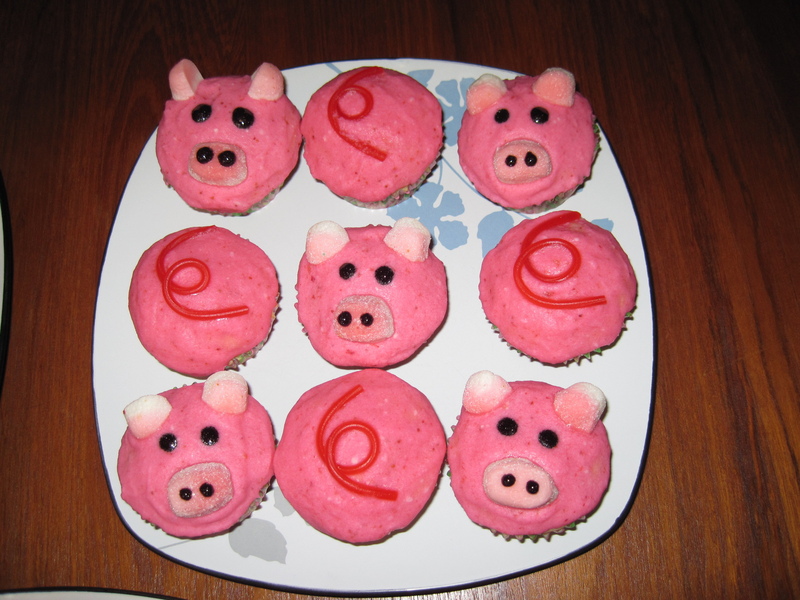 I had seen lots of pig cupcakes before, but they were always faces. I had the idea to make to make pig faces AND pig butts (complete with curly tail!). It turned out that Hurricane Irene came that weekend, so we decided not to go to the roast. But, there was no way I could NOT make these cupcakes. I loved the idea way too much. So I made them for the following weekend, when we attended a football party. Footballs are called pigskins, so it actually went with the theme (even if it was a little stretch). I used a basic vanilla cupcake recipe, and topped it with strawberry buttercream icing. 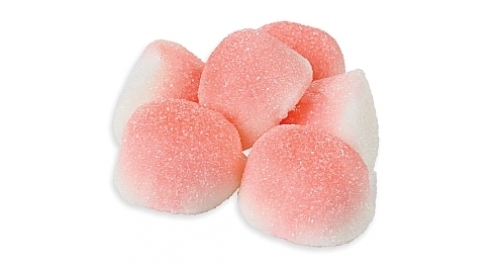 Grind frozen strawberries in a food processor until they are finely ground (do not defrost). Cream room temperature butter with an electric mixer until smooth and fluffy. Gradually beat in confectioners' sugar until fully incorporated. Beat in vanilla extract. Pour in milk and strawberries and beat for an additional 3-4 minutes. Since frozen strawberries add water to the recipe, use only 2 TBSP milk if using a full cup of strawberries. You will end up with a light pink frosting. If you want a more shocking pink, you can add coloring right to the recipe and have the mixer do all the work for you. Once the frosting is the right color, frost all cupcakes. Then dip a knife in hot water, wipe off with a paper towel, and smooth over the frosting of one cupcake. This will give a nice, smooth appearance. Repeat for all cupcakes. Next are the details. I’m a big fan of using candy for details. Normally, after frosting a cake I would put it in the fridge to harden up before decorating. In this case, I would put all the details on FIRST, and then put in the fridge. You want to put all the candy on while the frosting is soft and a little sticky. I made the snouts and ears out of gummy strawberry puffs. I cut one gummy in half for the ears, and I left them whole for the snouts. I cut them with a pair of kitchen scissors, to get a nice clean cut. I dotted the eyes and nostrils using black Wilton Sparkle Gel. I can’t tell you how useful this stuff is. It comes in many colors, and dries pretty quickly so you don’t have to worry about dripping. It is great for detail work and especially if you have to do a lot of details in a lot of colors. Much easier than mixing different batches of royal icing. For the tails, I used Twizzlers Pull and Peel. I used half of a single strand for each tail. I molded them into the squiggle right before placing on the cupcake. And there you have it. These cupcakes inspired my next project, which I’ll be posting about next week. Can you guess what it is?